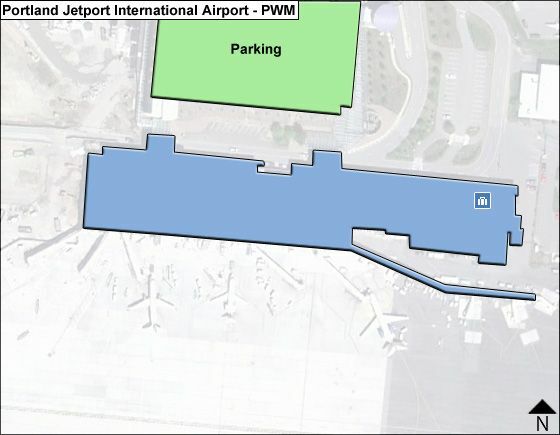 The attractive passenger terminal at Portland Jetport, which has recently been expanded and upgraded, is now double its former size, with a geothermal heating/cooling system. It offers more security screening lanes, comfortable seating, food choices, discount flights and destination choices. The terminal is user-friendly and fully accessible to disabled persons. - to the left - the ticketing lobby for all other airlines with access to their gates on level 2. On level 3 is the Security office and the skybridge to the parking garage. If arriving at the parking garage, take the sky bridge on level 3 connecting directly to the terminal. Arriving passengers who are being picked up should note that the baggage claim area is right across from the cell phone parking lot. - simply walk over.